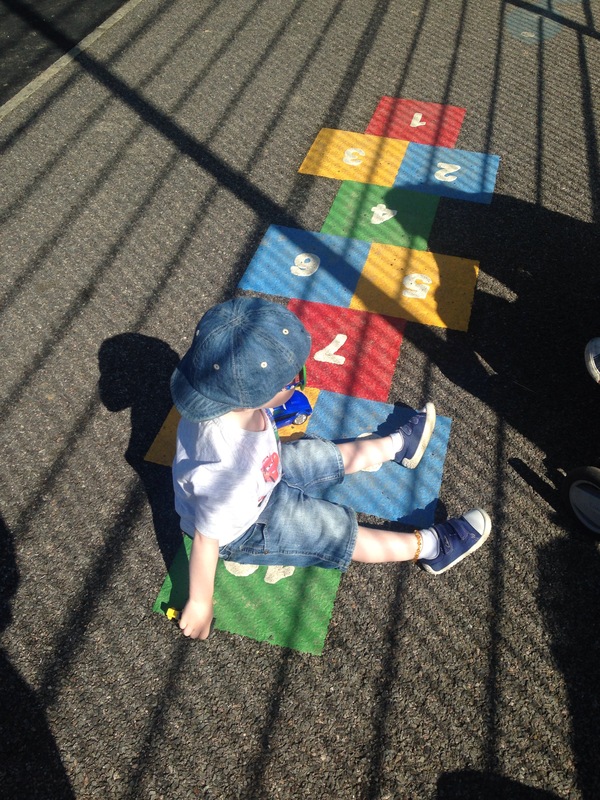 Although I know it’s a normal learning stage at 2 1/2 years J loves to recite his numbers – but rarely in order…any tips for helping him to sequence? Clare from Clare’s little tots came back with a gem of an idea (a kind of paper version of numbers through the hall) and it really captured my imagination. Unlike most halls ours is large and square rather than long and narrow, whilst I put my brain into ‘Mummy Mind mode’ we took a break to our local park, as I looked down on the floor I realised the work had been done for me. 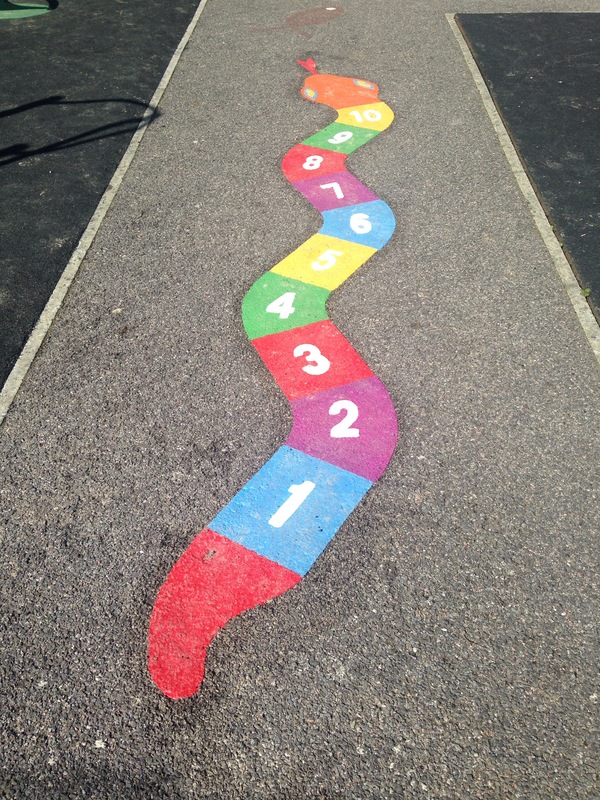 This snake (below) is ace for sequencing and so many lovely games! The photo above shows J and his cars…(who in there right mind would ever leave the house without a car / digger in each hand?) on a classic hop scotch, however we recently played a lovely game where I asked him to put the car on the ‘number 3’ etc and it seemed to help him with number recognition. So, I guess this blog is about realising that sometimes the work has already been done and we need to utilise it. 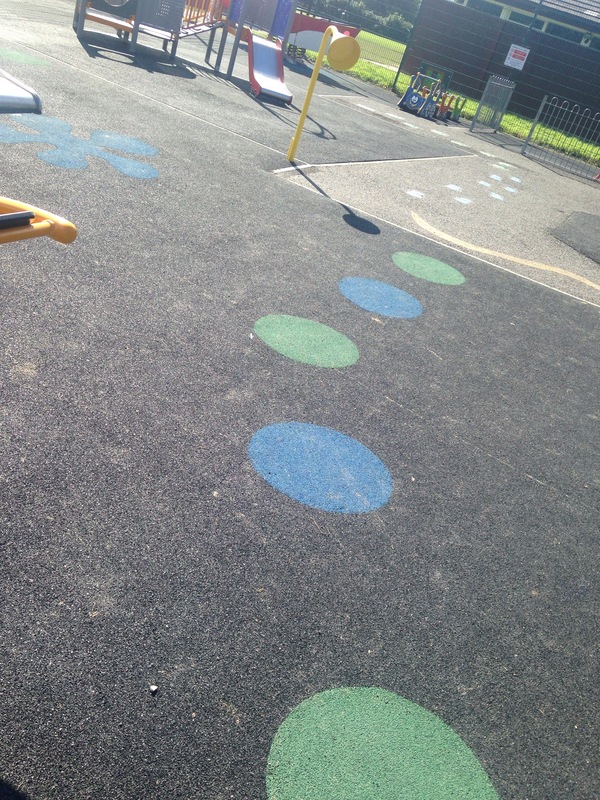 Next time you and your monster crew are at the park take a moment to look at the floor- you may be inspired! Don’t be put off by the weather either, I find the floor activities are even more enjoyable with the slides / swings are wet…plus a puddle adds an entirely new dimension to play, and it’s generally quieter. We had the number sequencing okay, the number recognition was the problem (it is still the same with the alphabet too). For the numbers, we took the cars that my daughter loves to play with and put a sticker on top with a number from 1 to 30 written on it. Then we took an old piece of plyboard and drew a car park on there, with corresponding numbers. We then spent a fun hour sorting the cars and parking them in their correct space! 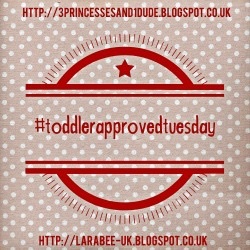 You are welcome, yes today’s post wasn’t so much a directed activity but something to help us get the pixie dust flowing. Good luck with the number snake and thanks for popping by.